Difference between "trial version" and "registered version". What is the difference between "trial version" and "registered version"? Q: Would you please tell me what the difference between "trial version" and "registered version" is? 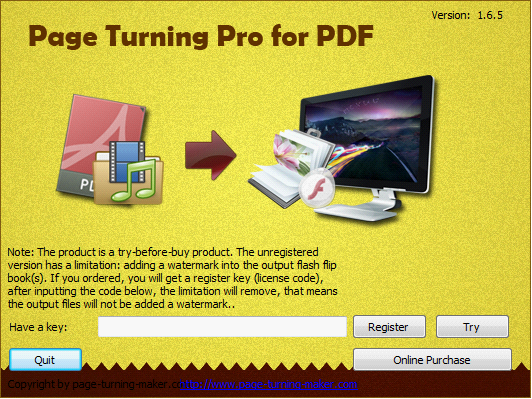 A: The trial version is a try-before-buy product, which has a 30 days validity and limitation: appending watermark to the output flash flip book(s). And after the probation period, you will be prohibited the use of software. With the registered version, you don't need to worry about these problems, and once you purchase our product, you will receive a key code which is valid forever. That means, you can update the software in the future for free.